The hustle and bustle of city life, although appealing to some, is not meant for all of us. Some prefer the peace and quiet of the country, where rush-hour traffic and dozens of neighbours surrounding you are mere stories of what goes on “in the big city”. Having said that, design styles which are typically found in city dwellings (modern, classic, ultra contemporary, etc.) also don’t fall in everybody’s taste categories. Such is the case with today’s discovery here on homify 360°—a modest little dwelling of the rustic style which enjoys its space and tranquillity out in the country, with tall trees and stretched-out landscapes serving as good neighbours, and also excellent mechanisms to make the house become literally part of nature. Upon our first look at the house’s façade, one thing that stands out is the fact that it was designed on stilts. Offering a variety of benefits to the homeowners (such as allowing construction on an unstable foundation and maximising views), this particular residence’ reason was ventilation underneath the house. Building a house on stumps allows for ventilation and cool air to flow under the structure, also protecting it from termites and other pests in the process. It also enables the natural flow of water in times of heavy rain. 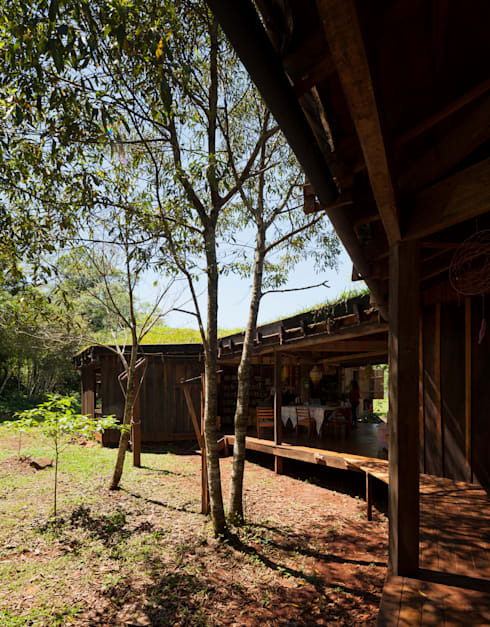 It is as if the house grew from the ground just like the surrounding trees and bushes. 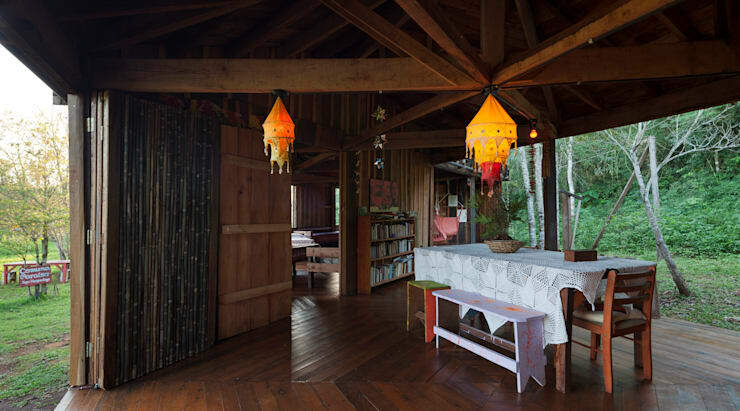 For one thing, it also presents ample timber surfaces, with the façade walls, floor, and beams all adorned with this raw and natural material. 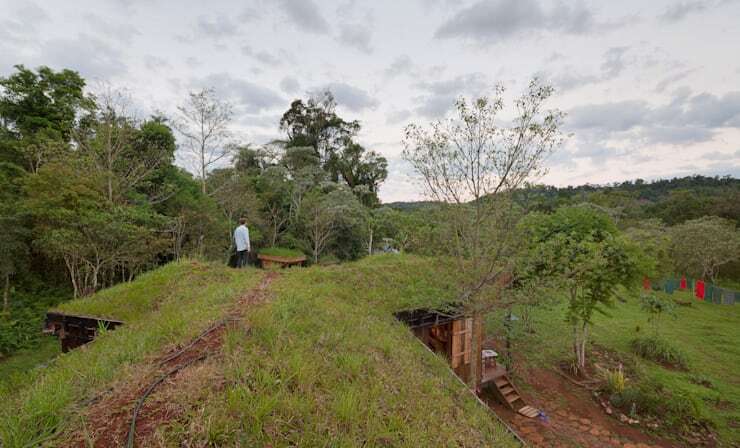 A lush portion of grass also grows from the ceiling, further helping this residence to melt into its natural surroundings. It would seem that wood becomes the star of the whole show, for it adorns the interior surfaces as well, from floor to ceiling, and select furniture pieces too. 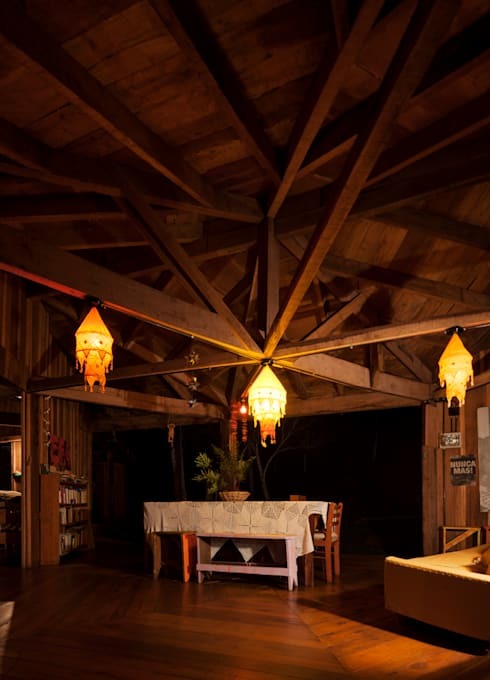 An inspiring design of ceiling beams join together in the centre of the roof, right atop the dining area. Three ceiling light fixtures add the necessary glow and character for the dining spot, ensuring a warm and welcoming ambience to go with those delectable dishes. Thanks to spacious porches and generous-sized doors that open wide, the rustic interiors of the cabin can become one with the lush landscape, beautifully blurring the boundaries between indoors and outdoors. With a residence that opens up as successfully as this one, any meal can become an al fresco-like occasion, regardless of rain or shine. 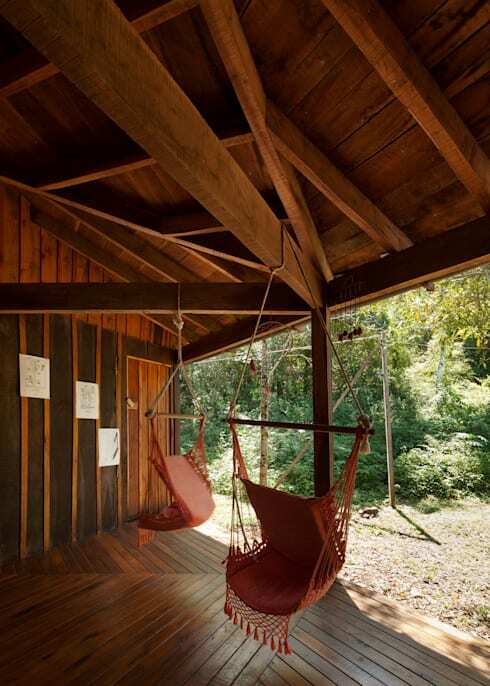 Of course if one stays in a landscape-bound spot such as this, one would definitely want to indulge in some relaxation to take in the peace and quiet – and what better way than some comfy hammocks tied to the porch beams? 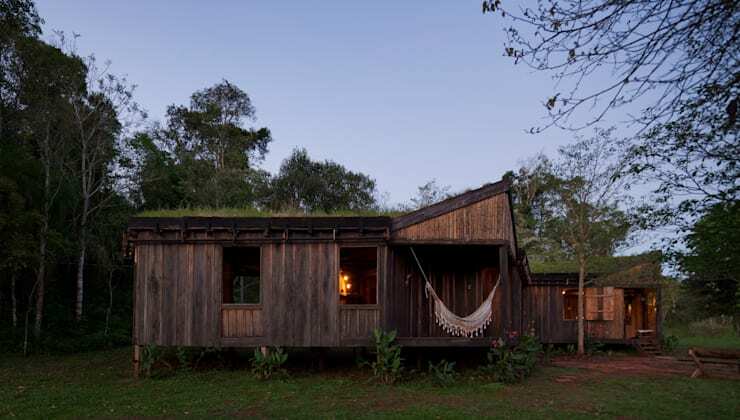 From this angle, the house successfully coats itself with nature, becoming one with the grass and landscape of this rural area. Were it not for the stone-clad floor to the right and the washing line in the background, one could have easily overlooked this spot as just another hilly landscape. Want to see some more cosy homes with lush landscape views? Then don’t miss: A small family home with character and charm. Which do you prefer: the busy cityscape, or the peace and quiet of a rural residence?